Oiliness is an uphill battle between me and my skin. My skin will look great in the morning but descend into a greasy downward spiral by the end. You know what they say, sometimes you’ve got to fight fire with fire or, in this case--oil with oil. Yep, the secret ingredient to controlling the oil production of your skin is to pat more oil into it. When your skin is dehydrated, it goes into overdrive to replenish itself and solve the imbalance. It tends to go overboard and leave you with an oily facade. Staying hydrated is key to maintaining this equilibrium and to make sure your skin is looking its best. Unlike creams and moisturizers, facial oils are far more concentrated so you can get more benefits per drop. That’s perfect because you’re going to want your skin to hoard all the nutrients and omega fatty acids that facial oils have. Omega fatty acids are great for every skin type. They rehydrate dry skin, reduce sebum production for acne prone skin, and help strengthen the skin’s barrier which is good for everybody! For the past couple weeks, I swapped out my regular moisturizer for Le Saint’s Radiant Glow Marula Facial Oil. The consistency of this product is perfect for me, it’s lightweight but soothing. I’ve tried oils in the past that were much heavier and honestly I was aware there was a layer of oil on my face the whole day. With this product, I felt like it absorbed into my skin quickly. Even my hands didn’t have any residue left, just rub the excess in and it’s like you never just slathered oil all over your face! Turns out, after some research, lighter oils like marula and jojoba are better for oily skin because they are less likely to clog pores. If your skin is more on the dry side, it’s good to keep in mind that heavier oils will provide you with more moisture. So the big question: did it make my skin less oily? And the answer is...* 5 minute drum roll* yeah, it did. I noticed that the excess oil diminished and I looked less shiny than I usually would. For me, it didn’t do too much as far as controlling breakouts. I rarely have acne now that I’ve found several products that really agree with my skin, but I got a couple mild blemishes while using the product. I definitely do not think the product caused them, but it didn’t go as far as to prevent it. That’s really my only gripe with it, otherwise I’m really happy with what it did for my skin. 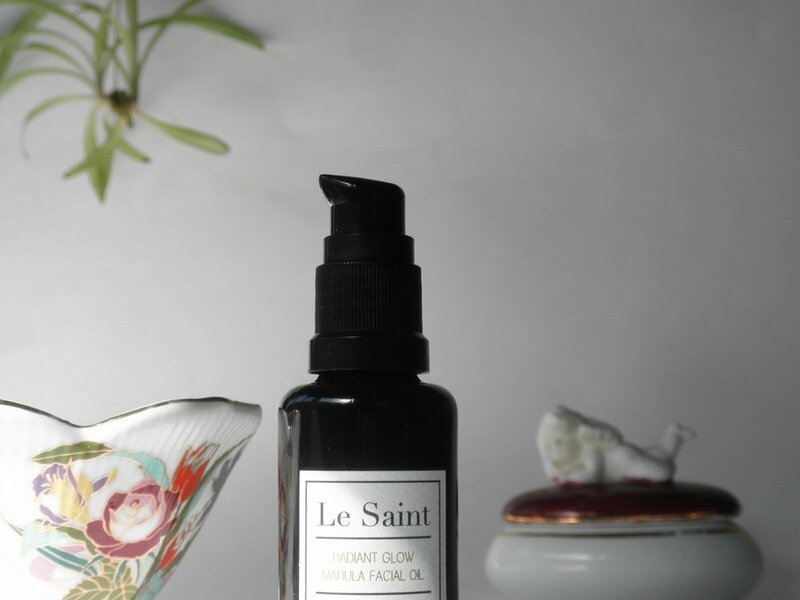 After cleansing, I would use just two drops of Le Saint’s oil in the morning but my skin felt moisturized all day. I’d say it had 10 hours or more of wear. This is going to sound so weird, but I kept wanting to touch my cheeks just because they felt so soft. You can really tell that it’s soaking deep within the skin, not just sitting on top. The cool thing about this product is that it is an oil, but it has a satin finish--not too dewy, not too matte. I think the hydrating aspect of this product is my favorite, it definitely could stand in for a cream moisturizer. This is a super moisturizing, soothing product for all skin types, but I would mainly recommend it for people with mild to minor acne. *THANK YOU TO LE SAINT FOR SPONSORING THE PRODUCTS FOR REVIEW.